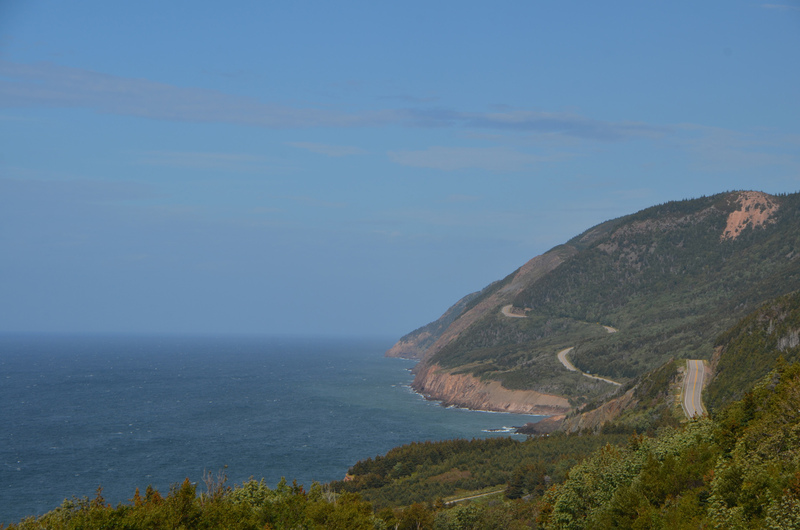 September 18th and 29th, 2015 – Cape Breton Island, Nova Scotia, Canada – Scenery for every occasion on this long day’s drive (I recommend longer). Low bank beaches on the eastern side face out to the open Atlantic, and maybe a chance for a swim in the height of summer, high bank cliffs on the west offer first class sunsets. 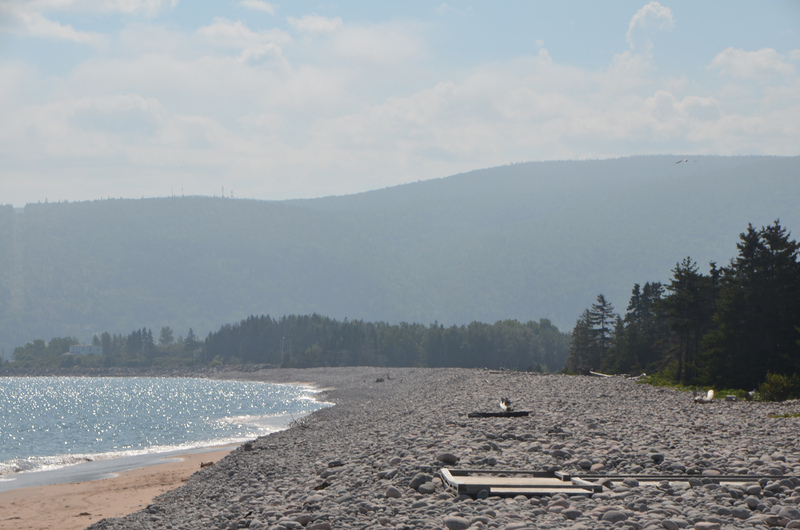 The Cape Breton Highlands National Park offers plenty of places for exploration inland as well. 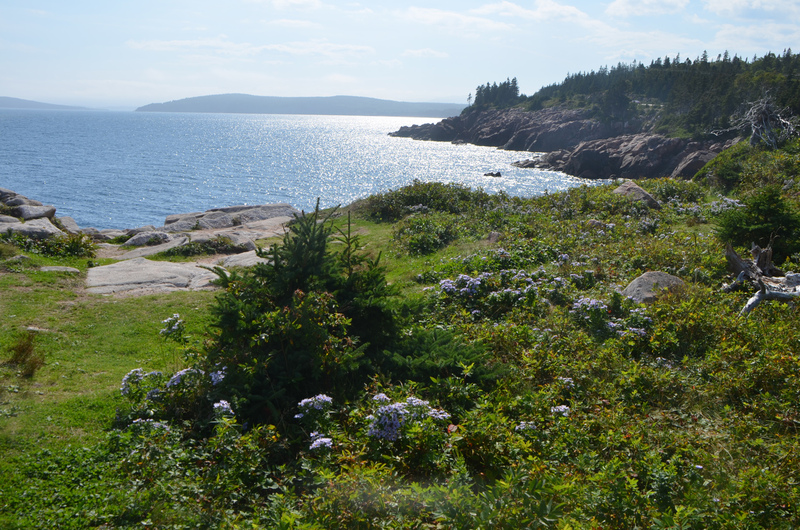 I explored this in separate drives about a week apart, one before going to Newfoundland and two after returning. 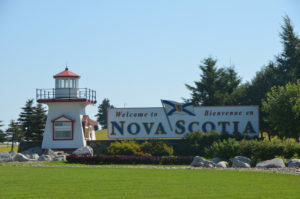 The border between New Brunswick to Nova Scotia is near where the confederation bridge crosses over to Prince Edward Island. About sixty miles along there is a fork in the road to take you either to the northern parts of Nova Scotia or the southern. If you choose the northern, you continue much further west before crossing onto Cape Breton Island and heading north. I found it to be a good day’s travel from Charlottetown on Prince Edward Island to my camp outside North Sydney. The road that circumnavigates the northern portion of this Island is known as the Cabot Trail. 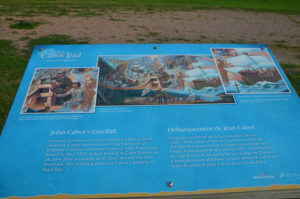 Named after the Italian explorer John Cabot, under English commission who is commonly held to have been, in 1497, the first European explorer in North America since the Norse had come some centuries earlier. The location of that brief landing has been proposed to have been several places in Labrador, Newfoundland, Nova Scotia and Maine, but the story, name and monuments are erected here just the same. As I read the descriptions of the road I had in mind the Oregon and Northern California coasts, and the old roads that twisted along tall cliffs. Often the discussion was whether to travel clockwise or counter-clockwise, then citing that clockwise puts the driver with a fear of heights more at ease, but requires crossing traffic to stop for a view, and vice versa. But being from the west I had imagined something much more dramatic. I felt like I was driving on any old country road for most of the trip. Not that I mind a country road, but the exposure feel short of my imagination. But then I’m not particularly bothered by driving on one lane gravel logging roads with a sheer granite wall above and 1500-2000 feet of exposure below, or for that matter hiking in similar conditions. As long as the road looks solid, I’m good, and even sometimes when it isn’t. But I think more to the point the question should be “who is holding the primary camera”? Now if that is the passenger, you probably want to go counter-clockwise, that way you can slow down and they can shoot from the window, whereas if the driver is the photographer, then clockwise for the same reason. Of course slowing down to take a photo is probably going to gain you some negative points with the folks following you, so try to pull off when possible instead. But in this shoulder season the traffic was less, and I was able to get away with things I wouldn’t try during the peak season. The east side of the drive is where you will find beaches for walking, wading and maybe swimming. It is also where you’ll see a nice sunrise. There are both rocky and sandy parts, with a couple of headlands to drive up and over. Heading counter-clockwise, stop at the visitor center and get a map and some help locating the right places for your favorite activities. Something interesting to note as you wander this side is the long row of worn round rocks or “cobbles” at the top of most of the sandy beaches. From small pocket beaches you could hardly climb down into, to the long expanses of sandbar that form across the harbors, bays and coves. Look for a long row of round cobbles at the top, it is the heavy Atlantic storms that have pushed these here and swept away the smaller stuff. These naturally occurring formations may look entirely man-made, but are the result of wave action. When you recognize them for the natural phenomenon they represent they take on a much more magical aura. The ocean is constantly sorting things by size and density. At the north end of the island I decided to take the road less traveled. 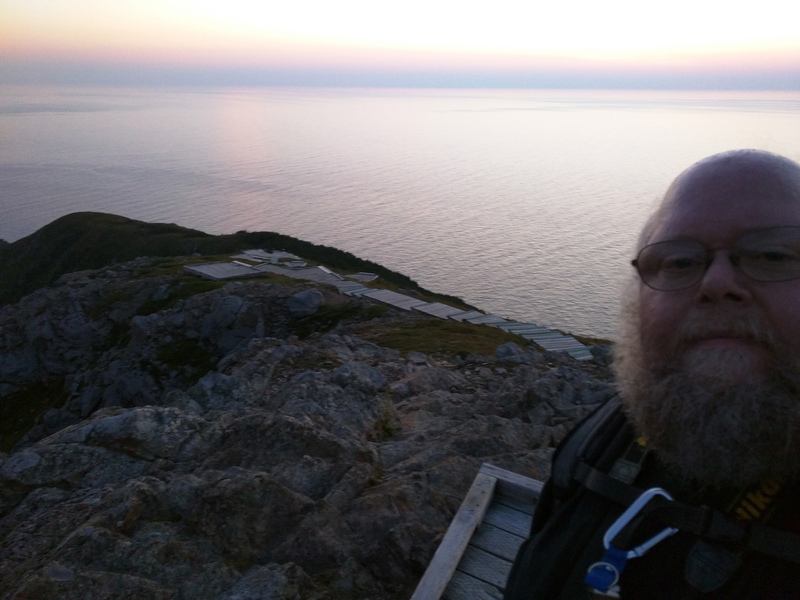 I headed out to the tiny community of Meat Cove. 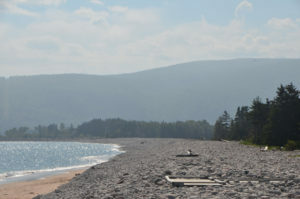 This is the furthest north you can drive on the Island, and a small bit of gravel road that is much more the adventure for its steep cliffs than the paved Cabot Trail. There is a small campground here, which I think I might have chosen for a night’s stay had I been inclined to bring the trailer up this way rather than do the day trip, and of course had I planned to stay a bit longer. Back to the main road I had selected a couple of trails for a walk. 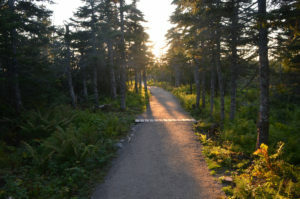 The first was “Bog”, a short boardwalk through a wetland. The other was “Skyline” which is about three miles each way. I arrived a little later than I had hoped, and I wasn’t sure I’d actually hike the whole way out and back, but I was feeling like I needed some hiking and so I geared up and headed out. I met a few folks coming out, but no one heading in this late. Shortly along I came across an unusual fenced off area. The fence was tall and stout, but the lower three feet were open. A bit further on, another of these was crossing the trail, here there were signs explaining that this was an attempt to keep moose out of the area to give trees a chance to grow. Apparently the overabundance of moose has been bad for new trees and the forest in general. So the fences allow smaller animals to get through. Shortly beyond this I encountered a very nervous young man. He was carrying a rotten hunk of wood as if it were a hiking stick. He stopped me and in hushed tones explained that I should be careful as he had seen a coyote along the trail just back a bit and that it was coming this way. 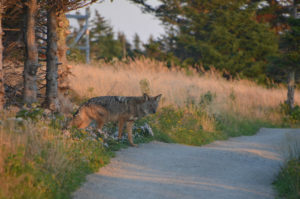 Apparently coyotes here have lost some of their fear of humans and have become more of a nuisance. There were indeed signs at the trailheads to this effect. I thanked him for his warning and we parted ways. About ten minutes later I spotted the coyote off the trail a bit to the right. I walked past a bit so I could get a bit better view and I would be further along my route. He was gnawing on some kind of bone or stick he had found, and pawing about. He lost interest in that in minute or so and start sniffing his way back towards the trail. He stopped as he came out on the trail long enough for a couple of quick photos, and then headed on his way at a slow walk. He turned back once, as if to check on whether I would follow, then headed on. It looked pretty healthy compared to coyotes I’ve seen previously, that thick coat looked ready for winter. A bit further down the trail I came across two couples excitedly talking among themselves. As I arrived and greetings were exchanged they explained that just a few moments earlier the young lady who had been in the lead of the younger couple had come nearly face to face (about ten feet away) with a full sized moose. 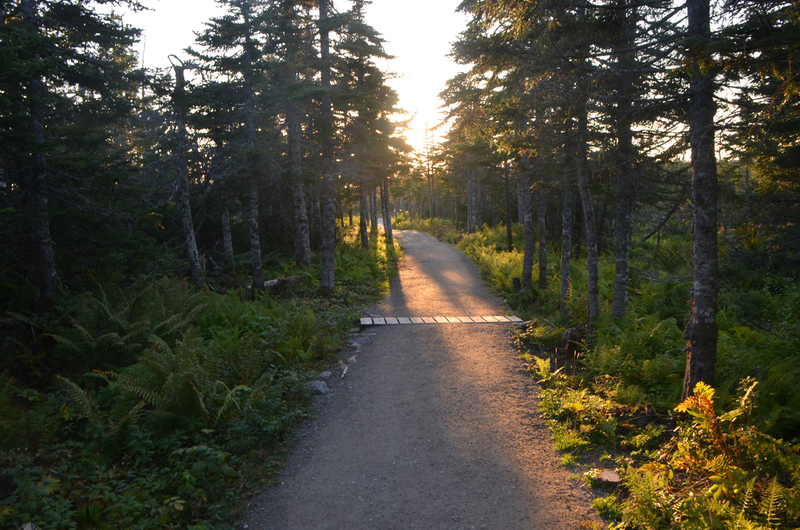 The moose was crossing the trail, and happily didn’t take any interest in them and continued. However the young lady was still trembling and shaky. So while I was interested in telling them about the coyote ahead, I was quick to play up how disinterested it was, and how far away it must be by now. Alas I had sort of hoped to be the one to see the moose, but it wasn’t in the cards. All that was enough to delay my arrival at the cliffs by about ten minutes beyond sunset. There were a lot of people gathered for this and I smiled and greeted them as they climbed up and I wandered down. A few at first realized I had missed the show and expressed their condolences. But as the crowd thinned I found a spot to enjoy the dying embers and as the last of the folks hurried to make their three mile journey in the dark, I enjoyed it mostly solo. The park has responded to this opportunity quite well, all along the stairs leading down they have provided small landings and benches where small groups can gather for a semi-private view of the sunset. The view behind of the road across the valley is impressive as well. 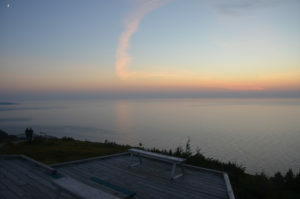 The gulf of St. Lawrence is plenty wide enough to hide any distant shore. A crescent moon hung in the sky, whose edge was painted in pastels. A long narrow cloud, probably a wind spread condensation trail from a jet further reflected the sunset and all this reflected in the calm gulf a thousand feet below. Skyline is about where the road comes out of the highlands and meets the coast on the west side as you travel counter-clockwise. South of here the road rises and falls, twists and turns, following the headlands along the cliffs and down into the coves. As the road leaves the cliffs it comes to a few small towns, and here is another opportunity to enjoy the local fare. I’ve been “eastest”, so turning 90 degrees to the right I am going for “southest”. About John Cabot. Some controversy here… the landing site recognized in the 500th anniversary celebration was in Newfoundland. East side beach, fog is lifting. 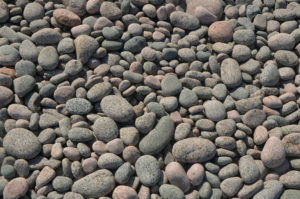 This long pile of cobbles is natural. 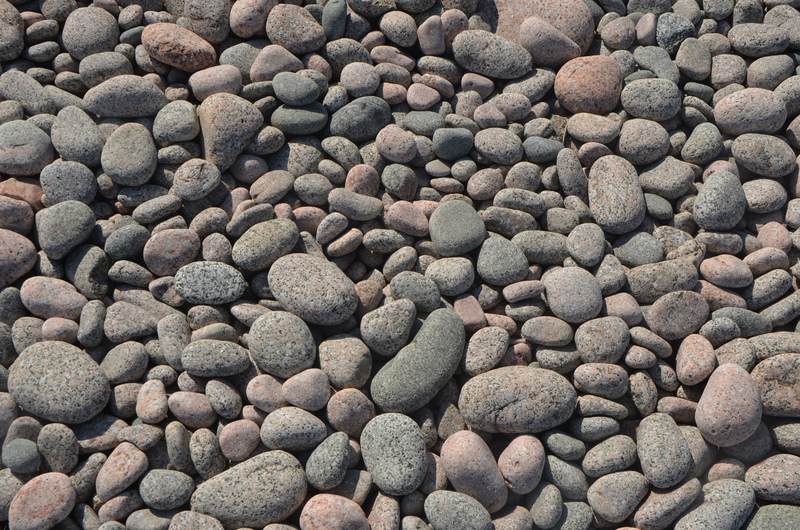 The transition from sand to rock is pretty stark, the shape and size of stones is quite uniform, and the lines quite smooth. And looking straight out over the Atlantic ocean. Further up the east side, the coast here is quite rocky. And the vegetation along the shore appropriately hearty. A park along this small river provides a nice picnic spot. The bar across the mouth of the river means the surface here is quite smooth, and the water typically less salty. A smaller stream joins the river near its mouth. Just a sliver of ocean is visible beyond the bar. The road to Meat Cove, where the road ends. This is as far north as you can drive on the island. 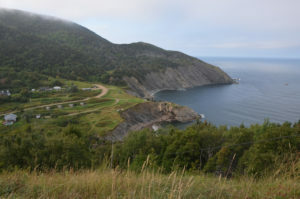 Campground at Meat Cove. Looking east where the road comes in. Looking west at that campground, and the end of the road. Looking east along the north side of the island. 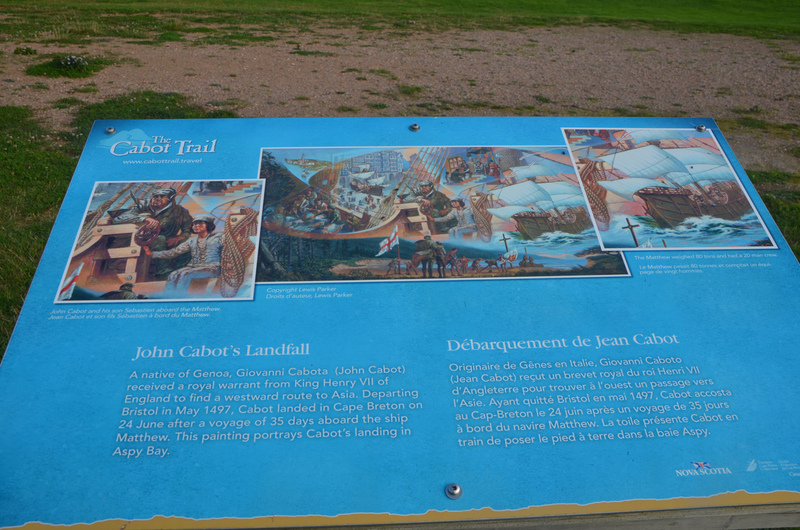 While we may not really know where Cabot landed we do know where Cabot landed, but we do know that the first leg of the first trans-atlantic cable ended near here. Coyote gnawing on something it has found off the trail a bit. The fence, note the lower couple of feet is uncovered to let smaller animals pass freely. They use a similar fence at Wind Cave National Park in SD to keep the Bison and Elk herds from mingling with outside herds. The gate is also just moose height. To the right and behind across quite a wide gap is the road continuing south along the coast. Benches provide a pleasant place to enjoy the sunset. Note the cresent moon. I’m guessing that cloud is a wind swept condensation trail from a jet. I had just come down this hill earlier and saw the sign as I headed back up. I had to take a photo so I could do the conversion later, but it seemed this was a lot of fuss about what seemed like a short hill. So 780 feet in 4.2 miles. Well respectable grade, but not news out west. Rocks off a headland on the west side. This small lake is on a headland, the road passing around to the left of the photo, we are looking north. The wind is very strong and at our back. The park had an educational program for kids that involved stopping places and getting stamps, this one was at a good place to watch for whales (in season). I found a small picnic area down by the water. Looking south along the west side. Interesting set of photos. Thanks for sharing.